The truth is there is really no Dark Side to Christianity. If it is uncompassionate, unkind, bigoted, hateful, hypocritical, selfish, prideful or ignoble it is simply not Christian. 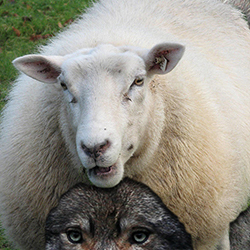 To call it so is to dress a wolf in sheep’s clothing. This entry was posted in Christianity, Objections to Christianity and tagged Christian, Christianity. Bookmark the permalink. It was then that she realized she still had God. He was the only one who hadn't left her. He knew who she was, even if he didn't. A single tear formed in the corner of her eye as she thanked God for not abandoning her - especially when she needed Him most.